Shamanism isn’t pretty; it’s beautiful, with the depths, pain, heights and joys of rebirth. Similarly the debut album of Laura Sakara Marshall, shamanic practitioner and vocalist, isn’t just good; it’s inspiringly powerful. Sakara has a strong haunting voice which is reminiscent at times of Siouxsie Sioux and at times of Kate Bush, but mostly her voice is originally unique and amazingly versatile suiting the gothic rock style of her music together with a hint of the mystical, perfectly. This expressive combination of musical style and voice together with some powerful guitar riffs, atmospheric effects and rock and shamanic tribal beats on the drums makes Blood and Stone unique and undeniably my favourite music CD of the year. Indeed once I got hold of this CD I enjoyed it so much I kept forgetting to stop simply listening to it and get down to actually writing a review! The first track “Bleed” tells of the darkly dramatic side of love. This is followed by “Rise”, Shakara’s call to the Ancestors, which is beautifully expressive going from the guttural to evocative haunting tones: “Rise Goddess. Rise. Bring back the dead. Rise Ancestors”. Rise then moves into a starkly spoken adaption of the Cree Prophecy “Only after the last tree has been cut down …” “Join You”, the third track is a beautifully haunting song of loss that moves into some wonderful guitar riffs. “By My Side” is slightly different, maybe slightly more commercial, and then you are taken into “She of the Throne”, an epic track which changes from dark whispers to soaring strength and which will resonate with many who have experience of working in the Otherworld: “black wings she wraps around me and I am no longer alone”. A journey into the underworld, “She of the Throne” evokes perfectly the complexity of the journey. “Ishtar” is a shamanic tale of rebirth many practitioners will recognise; ‘as I die she kisses me softly’, perfectly expressing in lyrics, voice and music the dark sweet depths of shamanic rebirth. “Earth Song” is described as containing channelled lyrics and is amazingly beautiful. The opening of this track brings with it a vision of the earth in its entirety and takes you on a journey which is hauntingly sad, yet hopeful. This leads perfectly to “Two Wolves”, a wonderful contemporary mix of Sakara singing a gently rocky tune with lots of wolf howling. Wonderful! “Soul Loss” Yes! A rock version telling the tale of soul loss to driving rock and great drum beats! “Kunoichi” – fight sexism with a kunoichi. She’ll take you down! Brilliant! I cannot think of a better articulation of my enthusiasm for these tracks than leaving the notes verbatim. (Note: Kunoichi is the only track on the CD which contains swear words). Highly recommended and I’m looking forward to the next CD from Sakara. 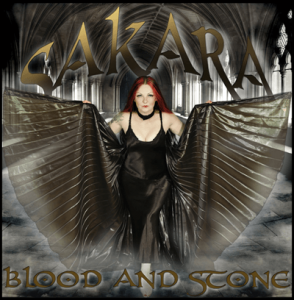 Blood and Stone, Sakara, Ravenheart Music 2011.